Welcome to a special episode of Wildstorm Addiction! 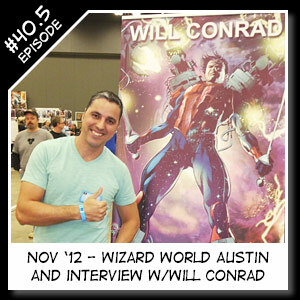 Our resident Wildstorm experts Joe David Soliz & Benjamin Murphy cover Wizard World Austin and give an interview to the current artist on Stormwatch, Will Conrad. Also friend of the show and co-host of the Only the Valiant Podcast, Chiclo stops by for a chat with Joe about the introduction of Wildstorm into the new DCU 52. 00:00:53 – Ben welcomes everyone to a special episode #40.5 and turns the show over to Joe. 00:01:19 – Joe introduces us to his weekend at Wizard World Austin and gives us all the news he’s learned from it. Thanks to all the Image Addiction listeners who have given our podcast a try. Our downloads have almost tripled in just a few days! 00:05:17 – Joe interviews current artist of Stormwatch, Will Conrad. 00:17:11 – Joe thanks Will again and recaps the interview a bit. Unfortunately he didn’t take any Stormwatch issues to get signed by Will but did score free V.I.P. lithograph thanks to friend of the show, Chiclo from Only the Valiant podcast who attended the show. We did first podcast crossover as I shared my thoughts on the Valiant books and Chiclo shared his thoughts on the Wildstorm stuff in DC. 00:18:59 – Joe catches up with friend of the show and co-host of the Only the Valiant Podcast, Chiclo stops by for a chat with Joe about the introduction of Wildstorm into the new DCU 52. 00:37:34 – Joe wraps up his conversation with Chiclo and agrees that we can’t get a break with all of the Wildstorm titles getting pulled out from under us. 00:40:00 – Ben gives a shout out to Chris Striker, of the TheAuthority.ws and Stormwatch.ws websites. Remember to visit The Higher Authority’s message boards Clark’s Bar to continue the Wildstorm integration discussions among long time Wildstorm fans at theauthority.ws. Be sure to check out our friends of the show, the Image Addiction podcast as they cover new releases from Image Comics and the Only the Valiant podcast as they cover the re-launching of Valiant Comics which current titles include X-O Manowar, Harbinger, Bloodshot, Archer & Armstrong, and Shadowman. The opening music is “Universal Domain” by Dreamline which can be found at http://www.musicalley.com. This entry was posted in DCU, Interviews, Podcast, Stormwatch and tagged interview, podcast, stormwatch, will conrad. Bookmark the permalink.